NDRMF is providing a common mechanism to pool various contributions and serve as a vehicle for donor coordination on disaster risk management by the government. NDRMF is supporting existing government entities and civil society organizations, involved in disaster risk management, including the National Disaster Management Authority (NDMA), Provincial Disaster Management Authorities (PDMA), District Disaster Management Authorities (DDMA), academia and research institutions etc. (vi)	Post-2015 Sendai Framework for Disaster Risk Reduction, 2015-2030. The Government has requested $200 million from ADB, through a stand-alone loan to contribute to the financing of the NDRMF and draft the National Flood Protection Plan IV (2016-2025). It is presume that the co-financing will explored to further increase the overall size of the loan. The Government will make regular (annual) budgetary contributions of not less than 20% of the amount made available by co-financiers and the Asian Development Bank through the loan. After the completion of the loan, the fund administration is the sole responsibility of the NDRMF Board and Management, and oversight will be performed by the regulator (SECP) and the government as stipulated under the law and articles of associations of the Fund. Fund Implementation Partners can be government entities, international donors, civil society and academia. FIPs may also include public-private partnership models. Entities seeking financing support from the Fund should first be accredited in order to be eligible to receive support. FIP already accredited by reputed international and national funds will be provided special exemptions to fast track the accreditation process. Each FIP will use the resources transferred by NDRMF and carry out activities in accordance with the contract signed between the FIP and NDRMF. Accredited FIPs will submit an application for financing and an Initial Sub-Project Concept (ISPC) based on criteria approved by the NDRMF Board and scope of activities in line with the NDMP, and NFPP IV. 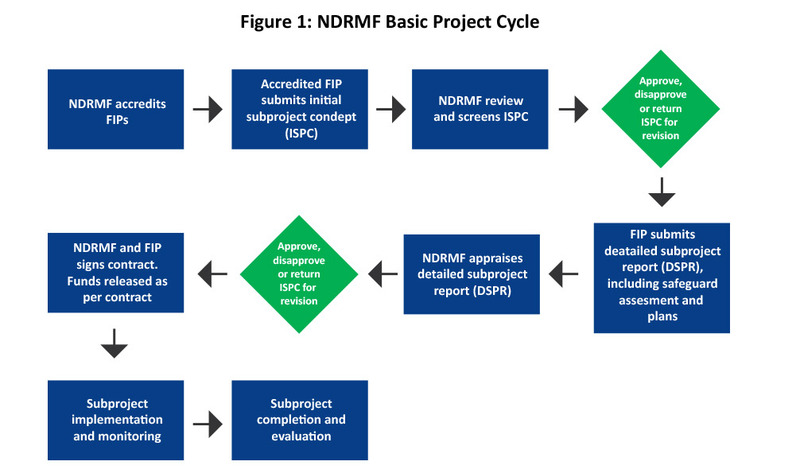 NDRMF will review the ISPC, screen the subproject in terms of safeguards, impacts and risks. The NDRMF will also recommend appropriate assessments and plans. Upon approval of the ISPC, the Fund Implementation Partner will prepare a Detailed Sub-Project Report (DSPR) that includes the detailed design, implementation plan, safeguards assessments and plans, required government approvals and other documents needed for appraisal of the subproject. Once approved, the NDRMF will sign a contract with the FIP for the subproject implementation and release the required funds. During the subproject implementation, the FIP will submit periodic reports, while NDRMF reviews and supervises subproject performance the commitments of the FIP as per the contract.